Simply known as Puerto. The sleepy fishing village in Oaxaca, Mexico also claims home to the Mexican Pipeline. A perfect pacific Mexican escape. I enjoyeda long weekend on the coastal beach town of “Puerto” when I called Mexico City my home. And although I prefer the Mazatlan native “el Pacifico,” I can hardly disagree that the marketing awards must go to Corona. The beer with its partner, the lime, signifies the beach, holiday, and is nearly as much Mexico as Tequila (to travelers). And during my adventure in Puerto, I snapped this photo at Sunset. Actually, a friend submitted to Corona for a contest. It didn’t win (as far as I know) but it certainly gave us some conversation for the next time we shared a Corona. 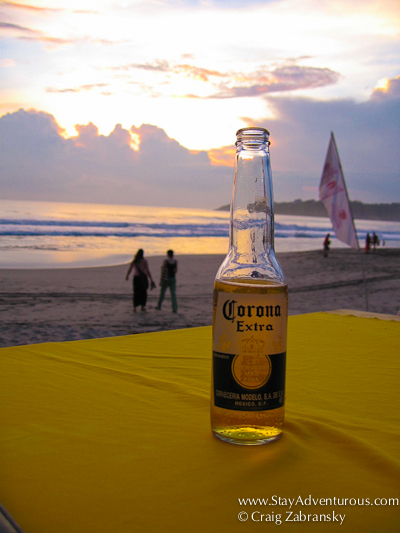 So this summer – enjoy your beach retreats and your Corona mentality. Cheers this Sunset Sunday.